UPDATE 12/1/2012A new protest has been called for the 14th January at 3:30 pm details are here but will be from Le Zattere near the waterbus stop! This evening saw a protest in St Mark's Basin against the super Cruises. 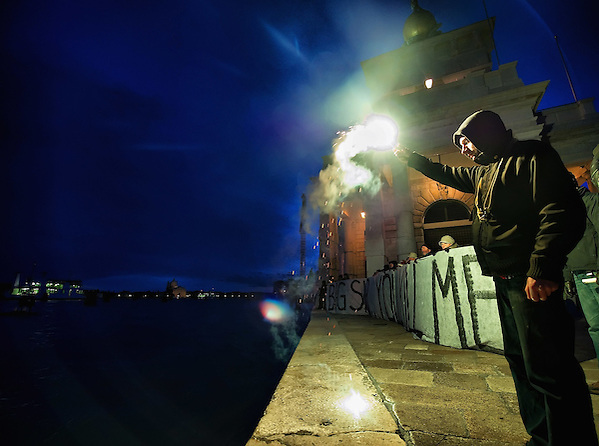 In the picture a protester holds a flare while on the banner is written "BIG CRUISES YOU KILL ME"
Giorgio Orsoni Mayor of Venice few days ago said cruise ships could be transferred to Porto Marghera, on the mainland, in order to minimise their environmental and aesthetic impact on Venice. Environmentalists and heritage groups have long pointed out that as cruise ships plough through the shallow Venetian lagoon, their powerful wake and undertow damages the fragile canal banks, wooden piles and mud banks on which the city rests. There has been a huge increase in the number of cruise ships visiting 'La Serenissima', as Venice is known, from 200 in 2000 to 510 in 2007. Last year 1.6 million tourists arrived in Venice by cruise ship, a more than fourfold increase since 1997. Venice's cruise ship terminal was the 10th busiest in Europe but is now the fourth most popular.